One of the reasons I blog is advocacy. I want to make the world a greener & more child-friendly place by getting more cars off the road. I have a theory that talking about how we live car-free will help convince a few people that it's doable. 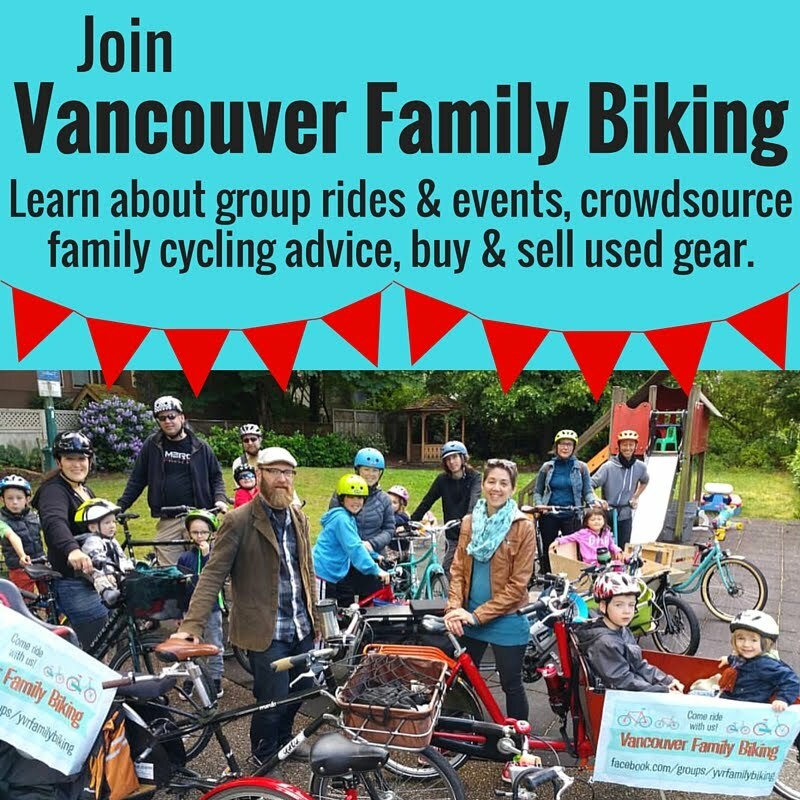 I think that cycling & car sharing are two great transportation options for many people. Call me a commie--I am, let's face it--but it's just not necessary for everyone to own their own car. I joined Modo in 2003. (It was called the Cooperative Auto Network at the time, but to simplify, I'll just its current name: Modo.) At the time, my main transportation was transit. I biked sometimes & walked a lot too. I thought it might be handy to have a car sometimes, but had no desire to drop tens of thousands of dollars to buy a good one, or deal with a cheap but unreliable beater. Suddenly having access to a whole fleet of cars was pretty exciting, as I'd never owned one. I never got used to having a vehicle waiting for me in my driveway 24/7, so the concept of making a booking online, then walking a few blocks to pick up a car wasn't a big deal for me. I probably drove a bit more than I really needed to because it was such a novelty. Still, I rarely used the cars more than once a week. In the fall of 2003, Oli & I got married. 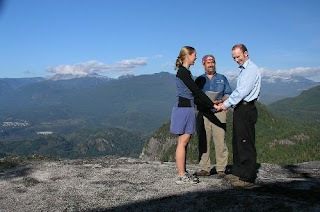 We used a Modo car to travel up to Squamish, where we hiked up to the Third Peak of the Stawamus Chief & got married by a friend's dad. We took the same little Volkswagen Beetle on our honeymoon to Galiano & Saturna Islands too, windows all decorated with washable glass markers. Fast forward a few years to 2006. Oliver had failed to renew his license within the deadline & needed to take his driving test all over again, so we decided to buy the car my brother-in-law was selling. Oli would use it to practise, then we'd quickly sell it after he got relicensed. Quickly turned into over two years. We owned that Pontiac Sunfire from 2006 to 2008 & used it about as much as we'd been using Modo cars: around six times a month. It took a while, but Oli finally got over his nerves enough to book & pass his road test. Sadly, we didn't sell the Sunfire before its four-year-old fuel pump went kaput. Quick tip: don't ever buy a car with a fuel pump that's inside the gas tank--it's going to be really expensive to fix. $1200 later (this was with a labour discount we negotiated with Tremblay Motors, because we are Modo members) we sold the damn thing. When I sat down & did the math on how much owning a car cost us, including insurance, gas, maintenance & depreciation, I was pretty unimpressed. $3000 a year despite really low usage. We drove it about twice a week & took it on a handful of road trips to the Okanagan to visit Oli's parents. We didn't use it to commute because driving downtown to work together & parking the thing there would have added another $1800 a year. Back to our car-free status, Oli became a Modo member & we started car sharing again. Modo had grown quite a bit since I joined, with over 200 cars in the fleet, so there were lots of fun cars to choose from. Having light trucks, minivans & small cargo vans as well as easy to park Minis, Prius & Vibes at our disposal is pretty awesome. We get a big one if we're bringing friends to a Giants game, or going to Ikea. We take a little one when we're driving to a house party in the West End (where we can park in any permit zone for free--did you know about that Modo perk?). 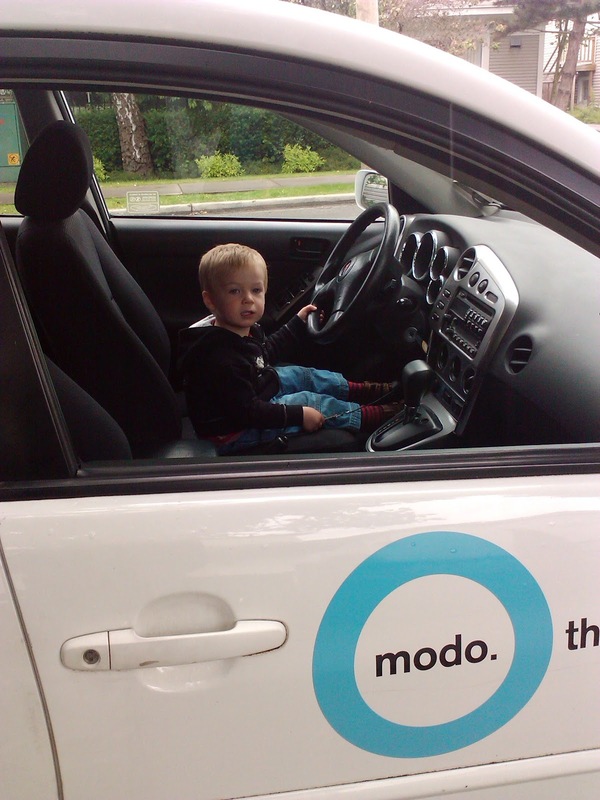 In 2010, we used a Modo vehicle to drive to BC Women's Hospital to have Sprout. I was pretty far along in my labour by the time we got into the car & the bumpy roads in our neighbourhood probably hastened Sprout's descent, but we made it before he was born. (Don't worry, I put one of those absorbent blue sheets on the seat underneath me!) Our midwife referred to the birth as 'textbook', so we were home again pretty quickly. Driving is a special treat for Sprout. Since having Sprout around, we drive a little less than we used to. Until Sprout was a year old, the infant car seat would fit in the stroller, so it was pretty easy to get him & the gear to the car. The car seat we have now is quite easy to install securely & take out, so it's not difficult when we're all going out together. However, when I want to drive somewhere on my own with Sprout it's complicated. I've got to bring him & the car seat to the vehicle, which is a five-minute walk away. The car seat doesn't fit in the stroller basket (even though the Uppababy has a huge capacity) so thus far, I haven't taken Sprout in a Modo vehicle on my own yet. Biking, walking & transit take care of our transportation needs the majority of the time. 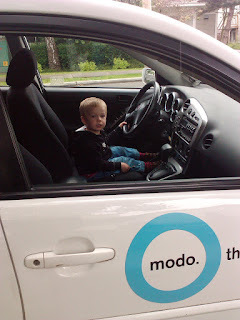 We use Modo cars about once or twice a month to go to Ikea, Costco or visit family out in the suburbs. Even though it's less convenient than having a car parked in the driveway all the time, I don't miss owning one. I like the freedom of not having to worry about finding parking on the street or if the car's been broken into or if I've paid the insurance. As Modo members, all the maintenance, insurance & nearly everything else is done for us. We occasionally fill up the gas tank if it gets below 1/4 full during our booking, but we don't pay for the gas directly. We just pay when we use the car--by the hour & by the kilometre. It's very predictable--no worries about big repair bills or expensive fill-ups. If you don't drive at all, you pay nothing. Our bill in the past couple of years has averaged $50 a month. If you're interested in learning more about Modo, visit www.modo.coop--there's an extensive FAQ section. Or email info@modo.coop, call 604.685.1393 (1.877.226.2277 is toll free in Canada + US). Modo staff are knowledgeable & happy to answer questions. Great post! It's amazing the money you sink into a car, knowing from experience. We've now been without for over two years and it's fantastic! Thanks for sharing your experience! I think it's so important for people to hear personal stories about carsharing to reduce their concerns on how it'd fit with their lifestyle. Well done! Great story! Modo's service offering makes an positive environmental impact by reducing individual car ownership and encouraging sharing, and also has big financial benefits for those willing to embrace the sharing model. I had my fair share of car sharing experience too, and I must say that I enjoyed the idea! I love the fact that I can choose to change or which car I want to use on a particular trip. It allowed me to experience driving different cars too. And the best part of car sharing is, you can save yourself some money - from gas bill, insurance, and maintenance to name a few. Great story - I am a carshare member and hoping to get through our first two years with a new baby without buying a car. Ours is a 15 minute walk from where we live, any tips on what carseat/stroller we should get? We usually bike and walk to get everywhere but need a carseat for those odd trips by vehicle....but hopefully one that isn't to annoying and heavy to carry or install each time.